To braid your hair to look like your favourite Een, such as Kendra Kandlestar or Uncle Griffinskitch. Braid your hair, making as many braids as you like. If your hair isn’t long enough for braids, you can add braid extensions. Kendra Kandlestar has seven braids (one down her back), while Uncle Griffinskitch has two braids, one down each side of his face. 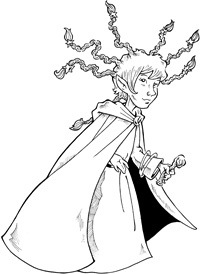 You can also decide to invent your OWN Een character by designing your braids however you like. If you need your braids to stiffen up, use pipe cleaners or floral wire to help support each braid. 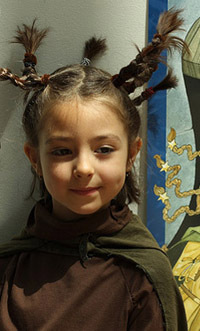 You can decorate your braids by using some simple styrofoam or wooden balls and stars. 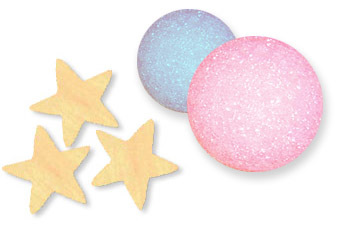 You can decorate these shapes to add some inventive color or designs. You may also choose to colour your hair. Choose a bright color to make it very lively!